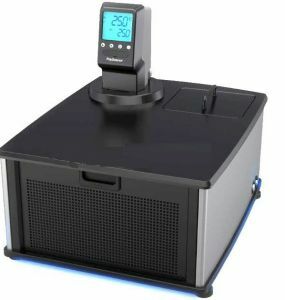 Product Description -20C, 7L Low Profile Refrigerated Circulator Bath with MX controller, 3.25" LCD Display. Working Temperature Range is -20C to 135C. Temperature Stability is ±0.07C. Temperature Calibration Capability: 1-point. Working Access (L x W x D) (cm): 15.7 x 14.2 x 12.7 cm. Pump Type: Pressure, Single Speed, 12 LPM. For precise and accurate viscosity measurement controlling the sample temperature is critical. BYK-Gardner offers a refrigerated circulating bath to cool or warm the sample to the specified temperature. The sample container can be placed into the bath. The low profile design allows for the rotational viscometer to be placed next to the bath to test the sample in the bath. For viscometers with water jackets, the the bath has a pressure pump with external (closed-loop) circulation capability. There is a visual alarm when the temperature is outside the pre-set limits. The bath complies with DIN 12876-1 Cass 1 safety requirements for use with non-flammable liquids.